A dream for divers and snorkelers, Cozumel is a diminutive tropical island in the Caribbean Sea off Quintana Roo’s Mayan Riviera. The island’s south and west coasts are encircled by sandbars and coral reefs, inhabited by multi-coloured fish, nurse sharks, sea turtles, rays, eels and starfish. 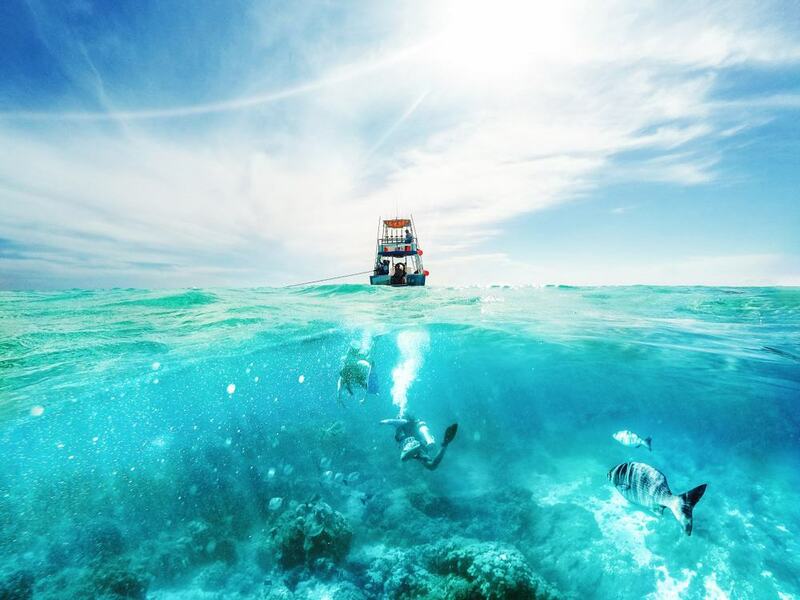 You don’t need to be Jacques Cousteau to discover this underwater life, as all you need is a snorkel and a boat. Hardier divers can contend with deep under-water drop-offs and drifts, or literally swim with the sharks when the bull sharks migrate to the area. Onshore the beaches are love at first sight, and the many upscale beach clubs catch the packs of tourists that disembark at Cozumel’s cruise terminals each day. Cozumel rates among the top diving destinations on the planet, and for good reason. It’s all down to the soft protected coral reefs, walls covered with underwater vegetation and drifts minutes from the shore. The waters suit newly-qualified divers, while people with PADI drift qualifications can journey to the Santa Rosa Wall, 15 metres deep and creased with overhangs and ledges inhabited by sponges, spotted eagle rays and pelagic fish. The Palancar Garden is less taxing, and a place where divers of all experience levels can get close to parrotfish and butterfly fish. Between November and March there are sharks off Playa del Carmen and open water-certified divers can spend some time in the company of these apex predators. Cozumel is much more than beaches and reefs; at San Gervasio are the vestiges of a site that had great value to Mayan culture. Dating back around 1,500 years the early-Classic period, the complex was devoted to the goddess Ixchel, for childbirth and fertility. As such, all Mayan women were expected to make a pilgrimage to the site and make an offering once in their lives. One monument to see is Las Manitas, so called for the red Mayan handprints on its walls. 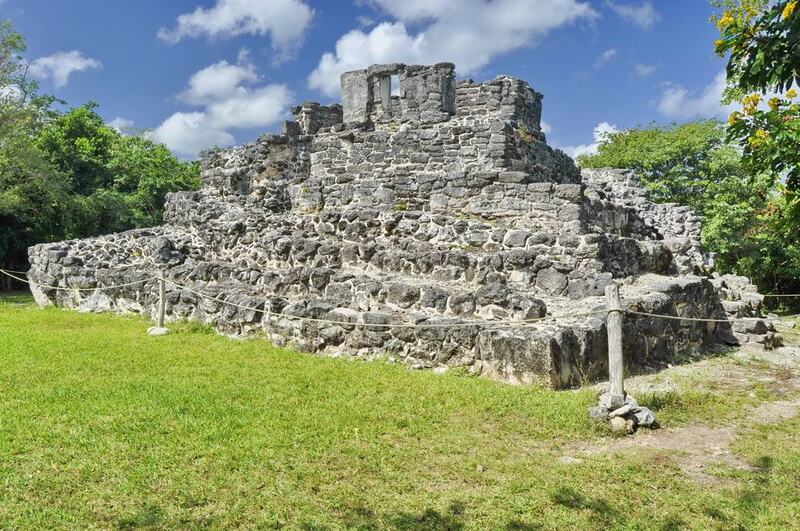 This was the residence of San Gervasio’s ruler around the time of the Classic Maya collapse. The largest structure on the site is the pyramid, Ka’na Nah most likely where sacrifices took place, while the “Central Plaza” is an ensemble with a group of buildings around an elevated central altar. The amount of businesses providing yacht charters and group tours around Cozumel is almost dizzying. And the reason they’re all here is for the island’s reefs off the south and west coast. These are bustling with exotic wildlife like manta rays, sea turtles, spider crabs, puffer fish, angelfish, moray eels and starfish. As long as the north wind is in check the seas are tranquil on this side of the island and many of the tours will give you snorkelling equipment and let you dive right in. 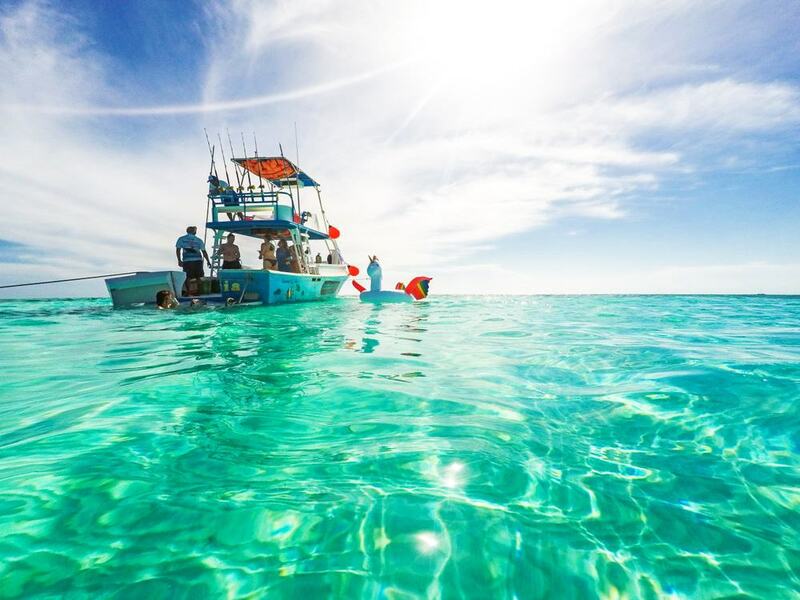 You can also stay dry and glimpse the life on the Dzul-Ha, Paradise Reef and Villa Blanca with a glass bottom boat tour, while sunset cruises are a dreamy way to round off a day in paradise. 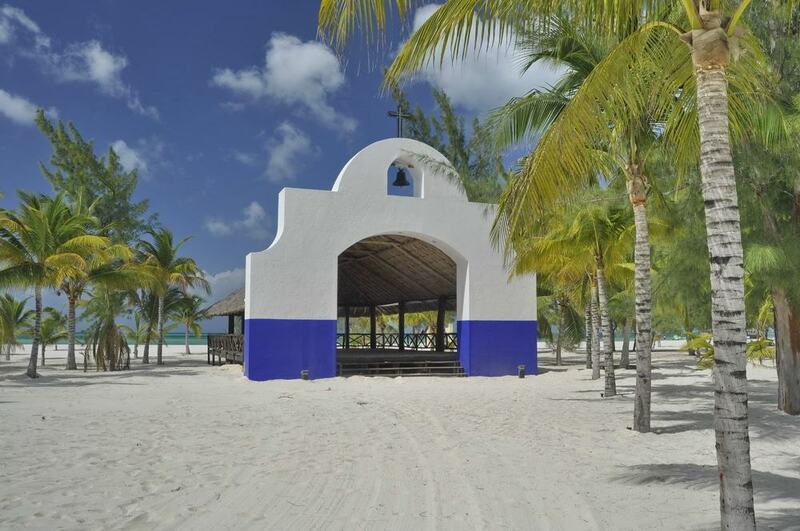 Just 15 minutes from the cruise piers, Mr Sancho’s is an all-inclusive beach club. Pay $55 USD and you’ll have a sun lounger, access to pools and drinks and food. As soon as you arrive you’ll be greeted by servers who will be at your beck and call for the whole day. Kids can hit the inflatable playground in the shallows, while if they pay a little extra parents can make use of the beach spa in the cabañas amid the coconut palms. One neat touch is the swim-up bar, while the menu offers tempting Mexican fare like quesadillas, shrimp tacos, fajitas and ceviche. There’s also complementary free Wi-Fi if you feel the need to make your friends at home jealous. After landing on Cozumel many cruise passengers will be directed to Playa Palancar on the gentler west coast. This is a private beach club, and a sun lounger and table costs $10 USD, or comes free with a meal. If you’re staying on Cozumel for more than a few days, it could be worth timing your trip to Playa Palancar for times when no ships come in. But even when the beach is busy there’s lots to love, be it the casual food (chicken quesadillas, chips and guac), friendly service and bright white sand lapped by tropical turquoise water. Among the palms behind are resident iguanas, peacocks and raccoons, and you can rent snorkel gear and hop on a boat to visit the much-loved reef not far off shore. On the windward southeastern coast, the public Playa Chen Río is an antidote to Cozumel’s busy beach clubs. This is a fabulous alternative if the north wind is blowing on the east coast’s beaches. The surf on Cozumel’s windward side is much livelier, but thankfully this buffered by a coral reef and the many rocks that litter the beach. You’ll be able to sit in warm crystalline tidal pools, while stronger swimmers can brave the surf in the quieter parts of the beach. You’ll be trading in creature comforts like waiter service and Wi-Fi for unfettered nature, but there’s a highly-rated restaurant where you can dine in the shade of a palapa with the waves breaking close by. 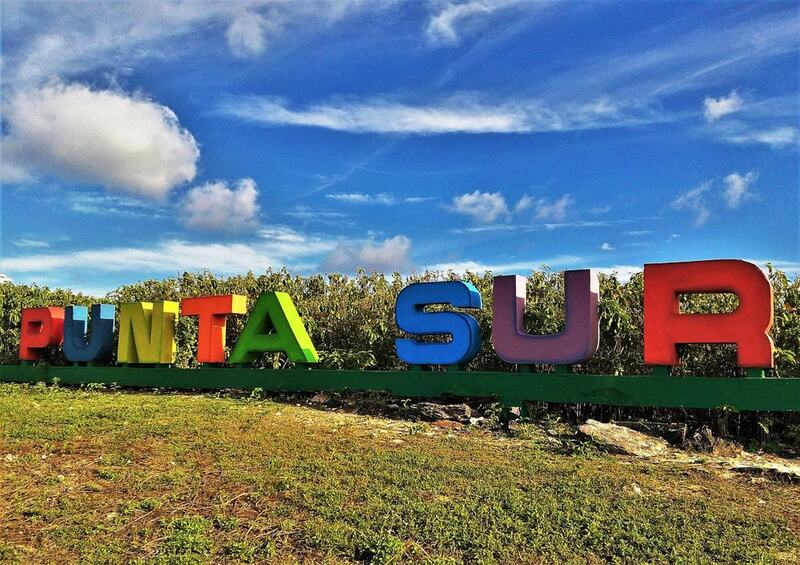 Effortlessly close to the ferry terminals is a park that gives you a whirlwind tour through Mexican culture and the civilisations of the Yucatán Peninsula. Some of the many activities in store are a José Cuervo tequila tasting session, a chocolate-making workshop, sipping mango margaritas and tucking into a taco buffet. The park has a folk art museum and a botanical garden planted with many species native to the peninsula. 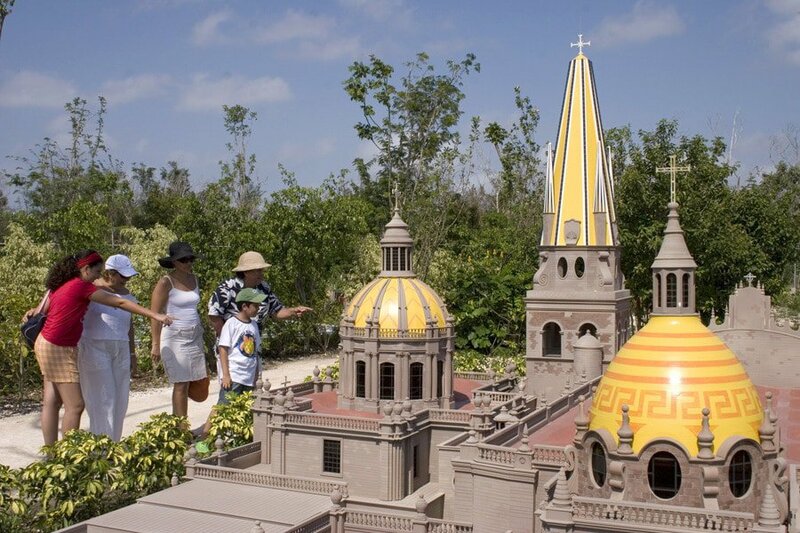 Meanwhile all of Mexico’s top monuments like the Temple of Kukulcan at Chichén Itzá are represented in large scale at the dioramic garden, where colourful birds, turtles and iguanas may appear at any moment. In English “el Cielo” means “heaven” and you’ll agree with the description when you see this beach off the south coast. Playa el Cielo is less a beach than a submerged sand bar about 700 metres from the shore. You’ll go there on one of many boat tours and will be given an hour or so to snorkel and bathe. The water is shallow enough to stand in, and is a mesmerising shade of turquoise that can’t be captured in photographs. The water is so clear you can admire the many starfish without goggles, and if you’re lucky a ray or pod of dolphins may swim past. 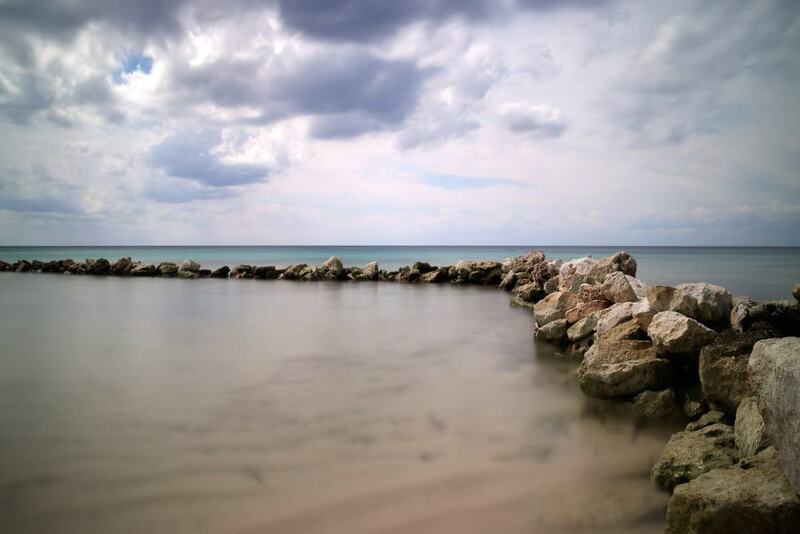 Cozumel’s largest eco-park, Punta Sur has a lighthouse, a lagoon and one of the best beaches on the island. Many people are happy just to bask on the beach, which is slice of heaven, with an arc of powdery sand fringed by hammocks and cabañas and pitching gently into the flawless waters. But there’s a wealth of things to get up to away from the shore. You can scale the 135 steps to the top of the Faro de Celarain lighthouse for a supreme view and take a short cruise across Laguna Colombia. Keep your eyes peeled for the crocodiles around the lagoon, living in their natural habitat, as well as vultures, pelicans, iguanas and turtles. And for snorkelers, the white buoy in the sea marks the position of a reef decked with gorgonians. 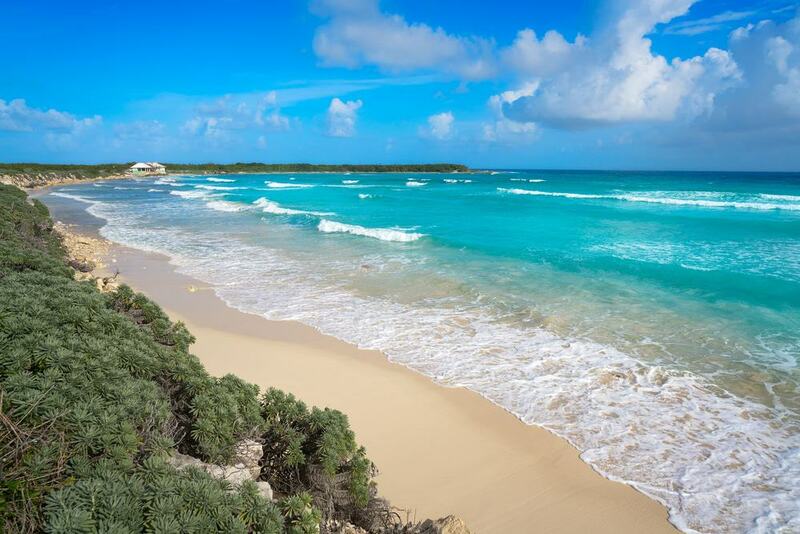 A 15-minute cab ride from the cruise port, Paradise Beach is a child-friendly place to recharge your batteries. There’s a long grid of sun loungers, which come included in the basic $3 USD entrance. You can opt for a variety of packages, for meals, drinks and water sports. But kids can use the slides, climbing wall and trampolines in the floating inflatable playground for free. On most days the sea is tranquil as the beach points west towards the Mayan Riviera, so little ones shouldn’t run into trouble. The cabañas on the edge of the beach are a mini spa where you can book a therapeutic massage if you really want to de-stress. 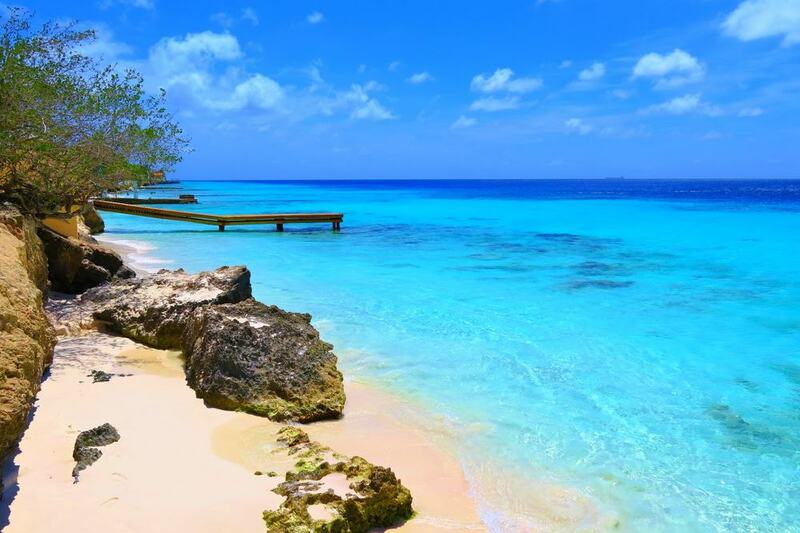 A private island off Cozumel’s north coast, Isla Pasión can only be accessed by boat from the cruise port. You’ll find yourself in a self-contained resort with pristine white beaches on a peaceful lagoon. If relaxation is in order you can drift off on a sun lounger and have drinks and snacks brought over by waiters, while suspended in the water are hammocks on frames. Unplugging isn’t for everyone, and you might get restless. If so a big programme of activities is available, whether you feel like kayaking in the jungle, riding in a jeep, paddleboarding, pedalling on a water tricycle, taking part in a limbo contest or taking off on a high-speed boat. One reason stand-up paddleboarding (SUP) has taken over the world in the last decade is that it’s an activity that most people can pick up. Age isn’t much of an impediment and children under 10 and people over 60 can be experts in a matter of minutes. If you find it tricky to keep your balance on the board you can kneel instead of standing, but the only thing that causes waves in the serene waters west of the island is the wake from boats. 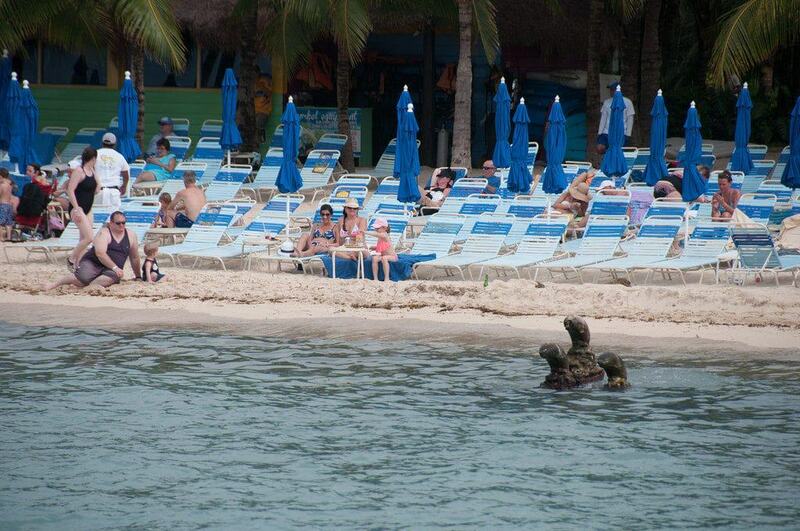 The main operator on Cozumel is Ha Haak at Mr Sancho’s Beach. 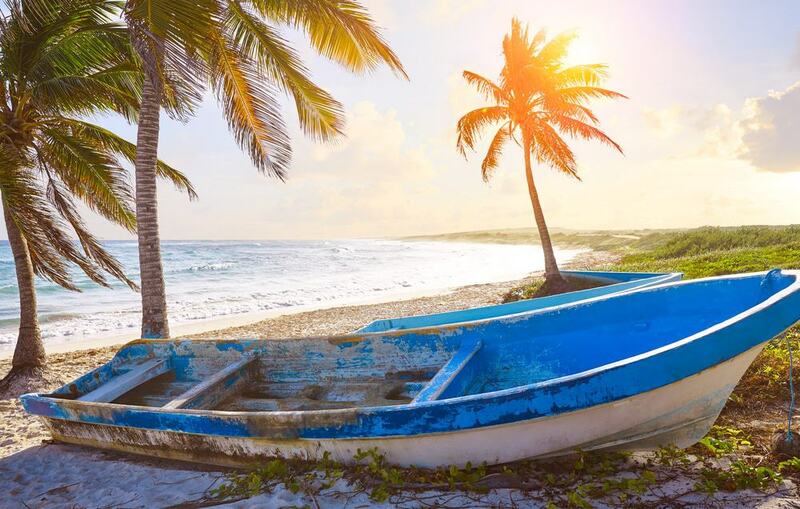 They offer introductory lessons and a choice of guided excursions, like a sunset tour from Playa Caletita or a 4.5-hour trip to the exquisite El Cielo beach. A neat curiosity if you’re passing by on the craggy east coast, El Mirador is an exposed coral reef pounded by the windward surf. Over time the currents have carved a natural arch and you can step over the jagged bridge to the tip of the headland to feel the full force of the sea. Facing east it’s a glorious place to watch the sun come up and there are grainy coral beaches either side of El Mirador. These are more comfortable than the jagged rock, but the surf is wild so they aren’t suited so much for swimming. Walk south of El Mirador for 50 metres and you’ll be at “the Jacuzzi”, a little hollow in the coral that fills with bubbling water when the waves crash against the shore. As far as tourist traps go, the Mayan Cacao Company is at least educational and has place-specific souvenirs and gifts to take home. The attraction is a cross between an outdoor museum and a shop, all designed like a Mayan village and charting the role of chocolate in indigenous cuisine and culture. The gallery has Mayan vessels and figurines, details the historic cocoa trading routes and shows footage of cocoa being harvested. You’ll set foot in a Mayan-style dwelling, hear about ancient customs and agriculture and try a tortilla with a typical chocolate sauce. The tour ends in the shop where you can sample a chocolate bar or chocolate drink before you buy. 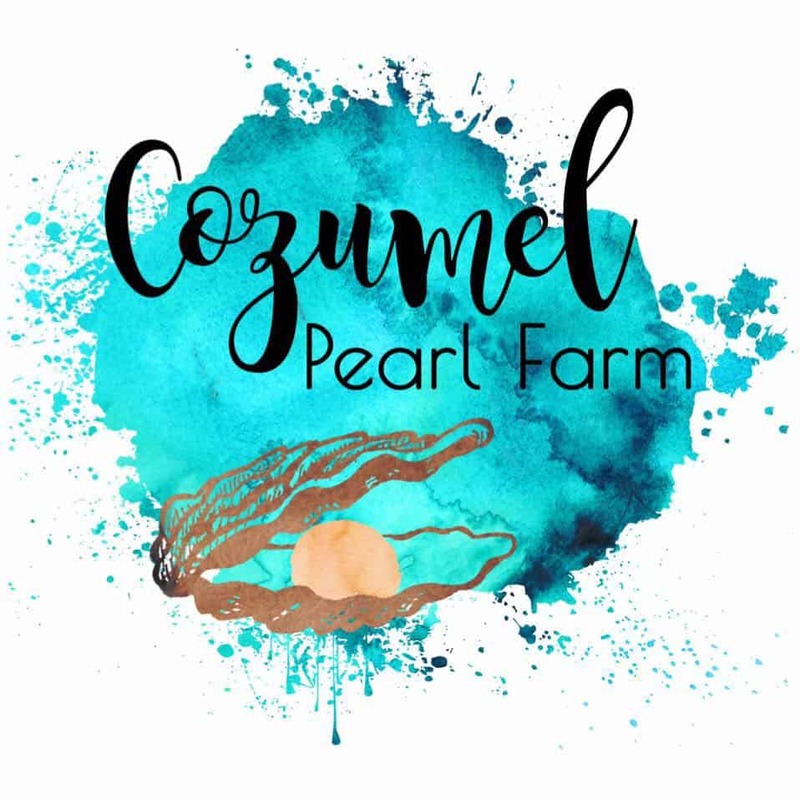 A tropical activity to write home about, the family-run Cozumel Pearl Farm has been welcoming visitors since 2012. As with Isla Pasión nearby, the only way to reach this isolated spot in the north is by boat, and you’ll be picked up from the San Miguel pier. A normal visit takes six hours, during which time you’ll learn how pearls are made at the farm, go snorkelling and chill out on a white sandy beach that could be out of a movie. There’s also a shop in case you can be tempted by a one-of-a-kind piece of jewellery. The price includes lunch and drinks, while the farm also offers overnight experiences when you can camp on a deserted beach like a castaway.